A patron came up asking for help setting up an email address. He said he's never had one before, and never wanted one, but realizes that to buy things and make reservations over the internet, you pretty much need one. So, as is our unwritten rule at the reference desk, I took him to Yahoo to set up one of their free email accounts. He understood the basic principle of having to fill out the registration form to sign up for an account. However, it was during the signup process that we ran into trouble. When I help people sign up for an account, it is extremely rare for someone to get their first choice of their Yahoo ID (the alias part of [email protected]). 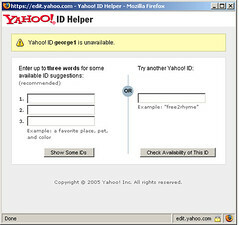 Usually the patron types something in, finds that it already taken, and then either tries something else or uses one of the IDs that Yahoo suggests. In the case of this patron, though, he was astounded that someone had already taken "george." And "george1." And "george2." ...and "george39." So I showed him how to type in additional words, such as his last name or his wife's name, to get additional suggestions. He found this fascinating. He thanked me for my help, and said he'd finish it himself. The patron then proceeded to sit there, trying different aliases. I checked back on him after a half an hour, and he was still trying different options. I looked over about twenty minutes after that, and he was gone. I don't know if he actually finished signing up for an email address or not, or if he just got frustrated and left. When I checked on him, he seemed to be enjoying himself, as if it were a challenge to find the perfect email account. It made me wonder how many Yahoo email addresses are out there, and how long a typical address needs to be now to be unique. And since I help people about two or three times a month set up an email account, I feel I need to come up with some strategy to more quickly find an available address. If anyone has any ideas, I would sure appreciate hearing it. Posted under Library, Reference Question on Saturday, February 3rd, 2007 at 11:28 am, by Brian Herzog. Post and comments available via the RSS 2.0 feed. Both comments and pings are currently closed. Oh man, I go through this a lot. I usually go with name/birthdate, or a lastname/firstname combination or something in another language, a pet’s name, a nickname, something, anything. Often I brace people for this ahead of time and warn them that they need a few choices, that there are 20,000,000 people with Yahoo accounts so their name needs to be pretty unique. I’ve had good luck with location names [beckyinroyalton] first/initial/last combos [jijobrennan] and nicknames [myrleflorice]. Mostly I just help them get through that part quickish because they will sort of sit there all day trying names out and it’s good to have some sort of guidance to give them. Thanks Jessamyn – perhaps the key is to mention it beforehand. I also like your idea of using locations, and I’m going to start suggesting that. It seems the only real solution is to keep adding and adding words, which makes the email id longer and longer. It occurred to me that this might create a market for selling short email id’s, but a quick check on eBay only found one auction for an email id (which seems to me might violate the user agreement).